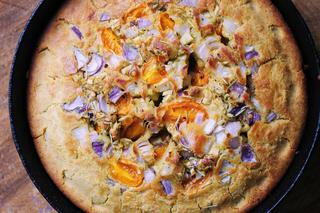 A positively easy and delicious gluten-free and dairy-free cast iron skillet focaccia bread made with fennel seeds, rosemary, tomatoes and onions. I whipped up this delightful bread whilst fancying a creative whim . . . I knew I was in need of a good gluten free bread -- the kind that fools you into thinking that you are eating gluten. Then I thought aiming for a focaccia would be a great place to start. This hit the nail on the head! Not only does it have a wonderful flavor and texture, but it is also super duper quick and easy to scratch together. Win-win. Throw in a pop of beautiful color with red onion, golden cherry tomatoes, and spices, and find yourself with one heck of a beautiful bread, too! If you're looking to wow your guests (or yourself) with a beautiful, and delicious bread - you will be pleased with this one. I promise! Preheat oven to 450°F.Place a greased cast iron skillet (or oven-proof skillet, or round cake pan) into the oven while it preheats.In a large mixing bowl sift together flours, baking powder, baking soda, and salt.Gradually stir in your remaining bread ingredients (water through vinegar), and mix until all is well combined.Carefully remove your hot skillet from the oven and pour your bread batter in.Drizzle olive oil on top, evenly sprinkle seasonings, and gently scatter your tomatoes, onions, and minced garlic however you so desire.Return your skillet to the oven.Bake for 5 minutes, remove and using a spoon or your knuckles, gently indent the dough around the edges.Return to oven, and bake for 15-17 minutes, followed by placing under the broiler for 1-2 minutes, or until your bread is golden and beginning to brown around the edges.Remove and let cool before slicing & serving.Enjoy!